Following the increase of prices at the Metro and Light Rail Transit (MRT/LRT) systems, protesters marched to the Department of Transportation and Communications (DOTC) building and hurled red and yellow paint at portraits of President Benigno Aquino III and Secretary Jose Emilio Abaya. “Aquino at Abaya, panagutin. Fare hikes ibasura. (Hold Aquino and Abaya accountable. Junk the fare hikes),” their placards read. 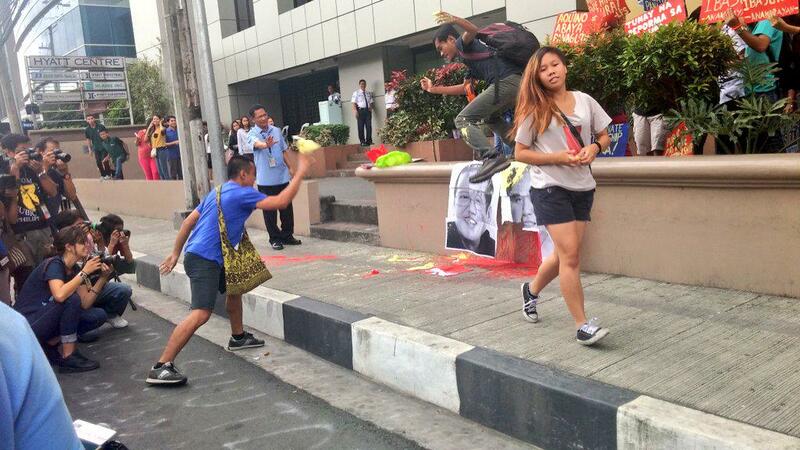 The protesters attempted to enter the DOTC premises, but failed to do so and continued to protest outside. Security personnel tried to disperse the crowd, but weren’t able to. DOTC Spokesperson Migs Sagcal issued a statement saying that they respected the group’s freedom of expression. Similar protests were held on the first day of implementation of the fare hike last Monday. Other commuters took to the internet and posted their selfie protesting the increase of prices. 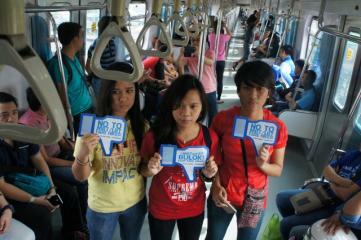 Youths posed in front of the LRT and MRT stations holding messages denouncing the fare increase. Various groups have also sought a temporary restraining order (TRO) from the Supreme Court against what they consider a treacherous move by DOTC. A total of four separate petitions have been filed with the High Court by the Bagong Alyansang Makabayan, former Iloilo Representative Augusto Syjuco, the United Filipino Consumers and Commuters, Inc., and Bayan Muna party-list. The petitioners questioned the basis of the increase, arguing that it is the government’s role to subsidize public transport and plug fund gaps. They also hit the move for lacking due consultation and being ill-timed as trains suffer from continuing breakdowns and poor maintenance. Since last Monday, the base fare of the MRT/LRT has been increased from P10 to P11, with additional P1 for every kilometer. A single journey end-to-end via the MRT now cost P28 while the trip along LRT-1 and LRT-2 routes now cost P30 and P25, respectively. LRT Line 1 connects Roosevelt Avenue in Quezon City to Baclaran, Line 2 links CM Recto to Santolan. while the MRT traverses North Avenue in Quezon City to Taft Avenue in Pasay City through EDSA.